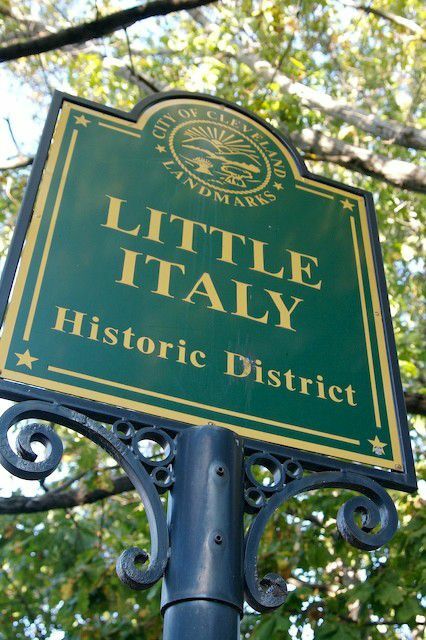 Cleveland's Little Italy neighborhood, located on Mayfield Road, just south of Euclid Ave., grew up in the late 19th century, fueled by scores of immigrants that came to the area to work as stone-cutters for nearby Lake View Cemetery and to work in clothing factories. Today, Clevelanders of Italian descent are located all over the city, but Little Italy retains that "Old World" flavor with restaurants, art galleries, and the popular "Feast of the Assumption" festival each August. We'll start our walking tour at Tony Brush Park, located at Mayfield and Random Rds., just past the viaduct from University Circle. There's limited parking on the streets and a public lot off of Mayfield, just north of the park. Tony Brush Park, located at the intersection of Random and Mayfield Rds., is one of the newer additions to Little Italy. This green space development was completed in May of 2007 and features a playground, a baseball diamond, lots of benches, and a basketball court. The park is named for champion boxer and Little Italy resident, Anthony Brescia (AKA Tony Brush). Holy Rosary Church, on Mayfield Road, is the literal and figurative heart of Cleveland's Little Italy community. The Baroque church, founded in 1892, still celebrates mass daily and offers a variety of services for parishioners and residents. The church is also the organizer of the annual Feast of the Assumption, held each August, a popular event that successfully combines the secular with religious celebration. Holy Rosary no longer has a grade school associated with it but does support a Montessori school for younger students. Corbo's Dolceria, located near the corner of Mayfield and Murray Hill Roads, is a delight for all of the senses. The store draws you in from the street with its enticing smells and captivates you with its beautiful displays. The family-owned bakery is known for its traditional cassata cakes, a yellow cake with strawberry filling between the layers). Also available are cookies, pies, pepperoni bread, and other goodies. Guarino's, located on Mayfield Road just south of Murray Hill Road, is the oldest continually operating restaurant in Cleveland. Opened in 1918, the restaurant specializes in Southern Italian cuisine, with veal dishes and hearty pastas. In the summer, Guarinos's has a spacious and inviting patio behind the building. There are several dozen galleries along Murray Hill and Mayfield Roads. You'll find ceramic galleries, paintings, glass art, photography, and an eclectic mixture of new and old at the changing array of establishments on Murray Hill Rd. Little Italy has transformed itself in the last two decades from an insular Italian neighborhood to a regional tourist destination, filled with restaurants and art galleries. The most dramatic reuse of space is the Murray Hill School. The neighborhood elementary school until the mid-1970s, today, the stately brick building houses a variety of artists' studios, art galleries, unique shops, offices, and condos. Walking the streets of Little Italy is a delight. Grand Victoria homes stand adjacent to brick storefronts with apartments upstairs. Many buildings have small gardens and courtyards that are best admired by touring the neighborhood on foot. Stroll down Murray Hill Road, between Mayfield and Cornell, for a good sampling.